ST. LOUIS • In the latest tremor from the ideological earthquake wracking Republicans nationally, conservative icon Phyllis Schlafly says the board of the advocacy group she founded 44 years ago is trying to oust her for endorsing Donald Trump. “It’s disloyal, and it’s terribly shocking, and I’m completely depressed about it,” she told the conservative website WND.com prior to an afternoon telephone meeting of the board of the Eagle Forum. 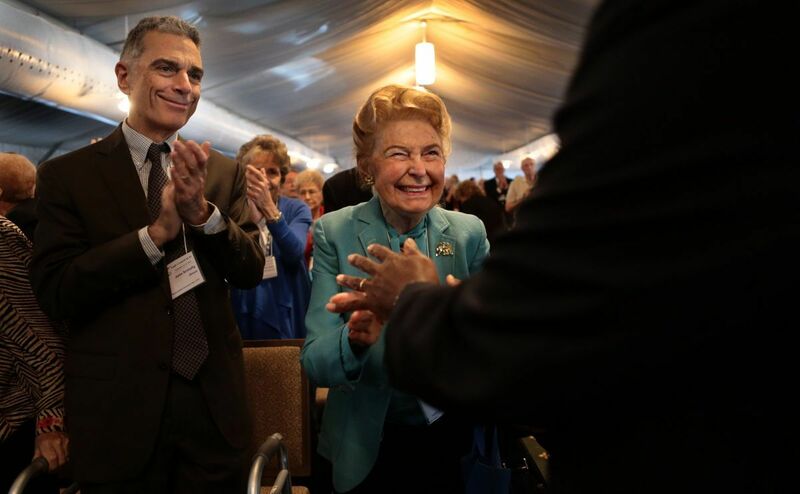 The board members on the other side of the divide include Schlafly’s daughter, Anne Cori. She, with at least three other board members, is on record endorsing Sen. Ted Cruz of Texas, who is battling Trump for the Republican presidential nomination. Cori implied that some of the criticism of the board that has been attributed to her mother is actually coming from Martin. Members of the board said in a statement that they ousted Martin in Monday’s meeting, specifying no reason. But Schlafly, in her own statement, alleged the meeting was “improper” and that its “conduct will not stand,” so it was unclear whether his removal is official. Neither Martin nor Schlafly could be reached for comment. One of the board members, Eunie Smith of Alabama, said in an interview that Martin was removed because of issues related to his “character and management style.” She declined to be more specific, and she strongly denied Schlafly herself has been targeted for removal as chairman of the board. “She’s a legend,” said Smith. Though Smith is on record endorsing Cruz, she denied that Schlafly’s endorsement of Trump is a point of contention for the board members. “We have always, in Eagle Forum, been free to disagree over candidates,” she said. But another board member, Cathie Adams of Texas, a Cruz supporter, told the Dallas Morning News last month that she has “no respect” for Trump, and she theorized that Schlafly’s endorsement of him was the result of “manipulation” from an unidentified source. Schlafly participated in Monday’s phone meeting. She claimed in her statement that she was “muted” from the meeting after she objected, an allegation Smith vehemently denied. Four of those six — Schlafly’s daughter, Cori; Smith; Adams; and Rosina Kovar of Colorado — were listed on a campaign webpage for Cruz in January. They were among 20 Eagle Forum officials from whom Cruz was touting endorsements. The Eagle Forum, based in Alton, is a conservative interest group that claims a membership of 80,000. It oversees a political action committee as well as a legal fund. Trump, the front-runner for the GOP presidential nomination, has deeply divided Republicans because of his controversial comments about women, his alleged encouragement of violence at his rallies, his denunciation of immigrants and other issues. Some prominent Republicans have vowed not to support him even if he becomes the party’s nominee. Schlafly, whose long history of conservative activism includes leading the defeat of the Equal Rights Amendment in the 1970s, has formally endorsed Trump. She appeared with him on stage during his March 11 rally at the Peabody Opera House in downtown St. Louis. Martin has been a controversial figure himself in posts that have included chief of staff to former Gov. Matt Blunt and as Missouri Republican Party chairman. In both jobs, Martin’s aggressive, heavily ideological style sometimes rubbed even fellow conservatives the wrong way. He also made unsuccessful runs for Congress and the Missouri attorney general’s office.